Adverse outcome pathways (AOPs) offer potential for more streamlined and informative risk assessments of new chemical entities. However defining the thousands of permutations of these complex pathways, encompassing a broad spectrum of molecular targets, is laborious. As discussed in the Eurotox-SOT debate, held at SOT 2018 in San Antonio, the process of collating AOPs is likely to be a rate limiting step, or “log jam” in our ability to employ both existing and some newer in vitro screening tools, such as 3D organotypic cultures that model human organs, in risk assessment studies. One solution to this dilemma has come in the shape of CRISPR/Cas9 screens. These tools have the ability to define AOPs more efficiently using in vitro techniques which can identify toxicity-associated genes by screening the entire genome in a pooled cell culture by a process of targeted genome-wide knockout/mutation. Selection of target genes is streamlined by utilising reporters that identify AOP targets and facilitate AOP building. Once the pathway is defined in an in vitro cell culture system, it can then be validated in vivo or in ‘organ on a chip’ systems. This approach offers a solution to the AOP logjam and offers more informative risk assessments and more efficient discovery safety screening processes overall. 3D heterotypic cultures can be useful models for investigating the complex, multi-step processes of AOPs. 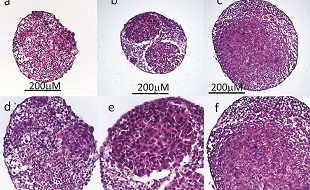 Using our spheroid tissue microarray system, SpheroMatrices, it is possible to screen for several different endpoints simultaneously via automated multiplex immunofluorescence staining and image analysis, providing an approach which can help in the in vitro definition of AOPs; see our technology page for more details or contact us to discuss.